After cancelling classes as of 3:30 p.m. and campus services as of 4:30 p.m. on Monday afternoon, the University of Victoria finally announced at 10:15 p.m. that the campus would be closed on Tuesday, Feb. 12 due to extreme weather conditions. 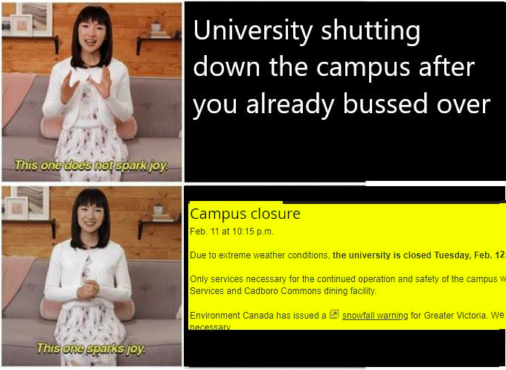 “All classes are cancelled,” reads the campus advisory posted on the UVic website. The advisory adds that only necessary services that ensure the operation and the safety of the campus will remain open — which are Campus Security, Residence Services, and the Cadboro Commons dining facility. For the last two days, Environment Canada has issued a snowfall warning for parts of Vancouver Island and the lower mainland of B.C., with a brief interlude between Sunday evening and Monday morning. 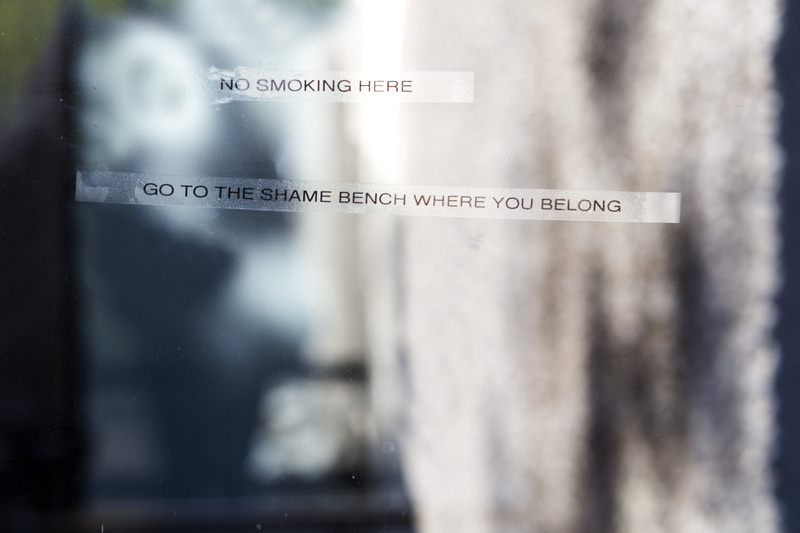 On Monday, many raised concerns that the university didn’t decide to close down earlier. The Native Students Union raised concerns in a Facebook post: “Keeping the university open on days when B.C. Transit’s HandyDart services aren’t functional, and when local schools shutdown district-wide, isn’t fair,” they wrote. 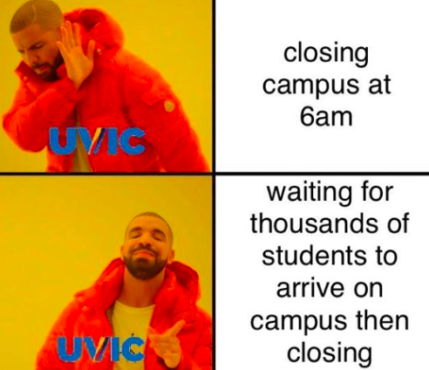 Meanwhile, the popular Facebook page “UVic Memes” was filled with memes about UVic’s choice not to shut down earlier. 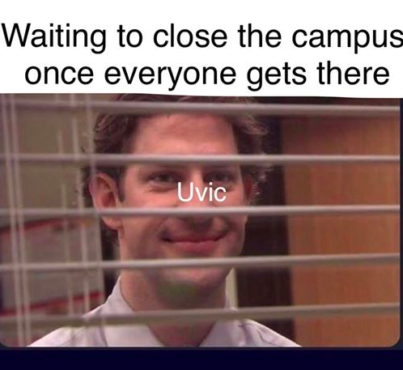 Photo accessed via UVic Memes. 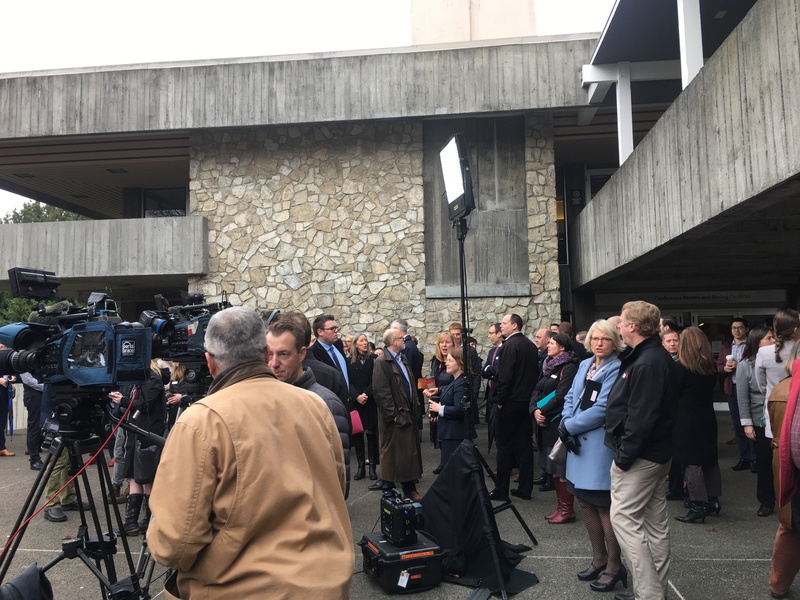 “Hopefully there will not be mass-strandings of students, staff, and faculty, as transit can barely operate in these conditions — UVIC went through this in 2017,” they said in another Tweet. The department is referring to the “Snowpocalypse” of 2017, when the university did not announce a campus closure until transit options were already on shaky (or icy) ground. Though the process for deciding when to shut down the campus is unclear, this we do know for sure: Tuesday is a snow day!